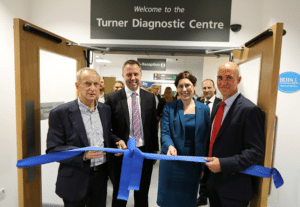 On Wednesday Staff, patients and well-wishers attended the official ribbon-cutting of the new Turner Diagnostic Centre at Colchester Hospital. Built adjacent to the Hospital’s Emergency Department, the state-of-the-art imaging Centre brings together key diagnostic imaging services into one place to make it easier and more convenient for patients to access the scans they need. It was part of the plan to transfer clinical services out of Essex County Hospital and also extend patient services under the new merged East Suffolk and North Essex NHS Foundation Trust. Since opening in April, the Centre has been getting up to speed over the summer months, with two new MRI scanners now in operation alongside a PET-CT scanner and the relocated nuclear medicine department. By increasing diagnostic capacity with the latest technology at Colchester, patients now have faster access to appointments and to results – already this is leading to shorter waiting times and quicker diagnosis. Over 20,000 patients are expected to be scanned in the centre this year. The centre was funded by Alliance Medical, which provides the hospital’s MRI and PET-CT services in collaboration with the Trust. In a close working relationship, they have been able to design and build a centre that exactly meets the needs of the Hospital and the dedicated teams who operate the 7-day a week imaging service.